We had the most hilarious and inspiring parenting incident not too long ago, and it was all inspired by a facebook post. I read this clever idea of requiring incident report forms when a child wants to tell on another child. I did not have a chance to make up some official forms before an opportunity arose. We were all sitting around the dinner table, and two of our children were not thrilled with the dinner selection. In our home, we try to be understanding, but we still expect them to eat what they are given. Naomi, being the somewhat bossy oldest sibling, felt the need to point this out. So I told her she had to fill out an incident report form. She got a half sheet of paper and I told her what she had to write down. She put the offending party’s name at the top, then described the incident. She then had to put what she thought the punishment should be. At the bottom, she was required to sign her own name and find a second witness that would agree to what she had written. Description of incident: Holly is not eating her food. She had convinced Gramma to sign with her, but hadn’t decided on a punishment yet. All the while, Doug and I were explaining that she better be completely accurate or she could be found a false witness. If she was found a false witness, she would receive the same punishment she wanted for Holly. Can you see why she was leery of deciding on a punishment? Gramma was helping her check her spelling and everything else they could think of to make sure it was accurate. Next, Doug and I included an explanation of the importance of two witnesses. In Torah, a case cannot be decided without two witnesses. YHVH would rather see the guilty go free (He’ll get them in the end.) than the innocent punished unnecessarily. So, we’re having this great discussion on Torah justice and the importance of witnesses and accuracy in reporting. Meanwhile, Holly has taken keen notice of the situation and is hoarking down her food like there’s no tomorrow. By the time Naomi was even close to submitting her incident report form, Holly had emptied her bowl and cleared out! Now, Naomi was left with a glaring problem. Her incident report form was grossly inaccurate. Yet, she was still determined to turn it in. Her sights soon fell on her brother Elisha. He had a half eaten bowl and a vacant spot. In the excitement of sharing Torah truth, no one noticed that he had vanished! So Naomi now began to alter her form. Gramma now refused to be a witness because she couldn’t see Elisha’s bowl from her spot. So Naomi roped Isaac into her scheme. He didn’t know how to sign his name so he hooked his letters together lol. Naomi carefully changed the Holly to Elisha, and finally decided on a punishment. Punishment: Elisha has to eat his food when we are watching a movie. After carefully weighing her words and deciding that she had been an accurate witness, she turned her form in. I was hoping to trip her up on the pronouns, but she even remembered to change the her to his. So we called Elisha over and confronted him with his reported crime. We explained that he could make things right now and eat his food, or take the punishment suggested and eat his food during movie time. Four year olds don’t always catch the ramificatons at first glance, so he responded that he would eat his food during the movie lol! I offered to help him instead and he finished his bowl in record time. If you are going to report an incident, you better be 100% accurate. You must have two witnesses to substantiate any claim. If you are not a good witness, you will receive the punishment that you intended for the accused. The ability to remedy the situation should be offered to the accused. Forgiveness is an awesome part of the Torah justice system! I love this! 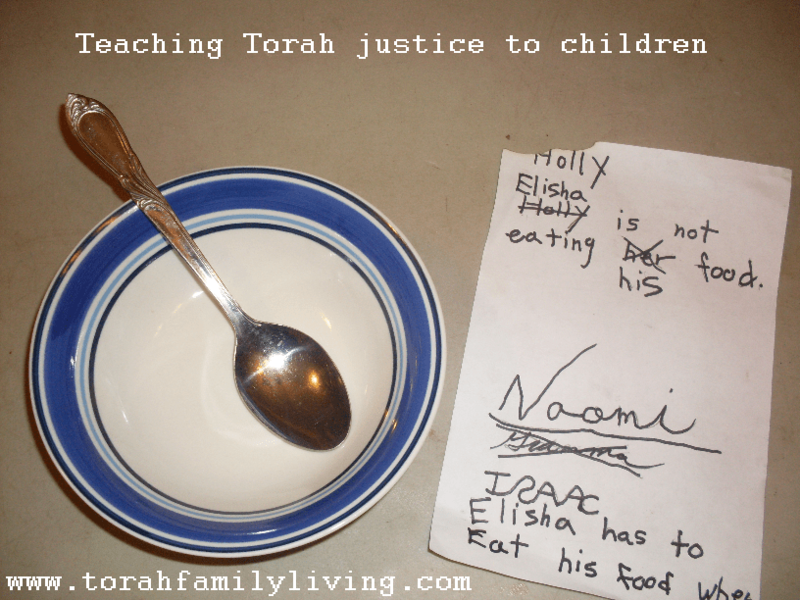 We are also trying to add these types of Torah principles into our daily living! We are also in Michigan, up near Petoskey. Are you guys anywhere close?